The Scourge is a disease that first appeared in Ani Mells land over three hundred years ago. Her people, “grubs” as they are called, are accused of originating the disease and this has caused them to be outcasts. A little over a year ago, the Scourge has returned. Now when anyone tests positive for the deadly disease, they are forcefully sent to Attic Island, a former prison turned refuge — and quarantine colony — for the ill. As a lethal plague sweeps through the land, Ani Mells is shocked when she is unexpectedly captured by the governor’s wardens and forced to submit to a test for the deadly Scourge. She is even more surprised when the test results come back positive. However, Ani quickly discovers that ‘something’ doesn’t ‘feel’ right about the Scourge or the Colony. So, Ani makes it her quest to discover the truth and figure out what is actually going on. Ani is fearless, snarky and hella fun but most importantly she is “not the type of girl who panicked over ordinary near-death experiences”. Ani’s people are referred to as “grubs” and town people are called “pinchworms”, setting up the stage for divisive class wars. The story is set in a sort of medievalish world plagued not only by disease but by divisive class wars. I love that Nielsen shows how these two groups have more in common and that coming together ultimately make them stronger against the “big bad”. Nielsen allows the reader to explore concepts such as hope, leadership, systems, fear, and cooperation. I really enjoyed the theme of friendship. It’s thoroughly explored through dangerous, precarious situations. While the book lacked world-building, I was okay with that because it gave off the impression that these events could happen anywhere. 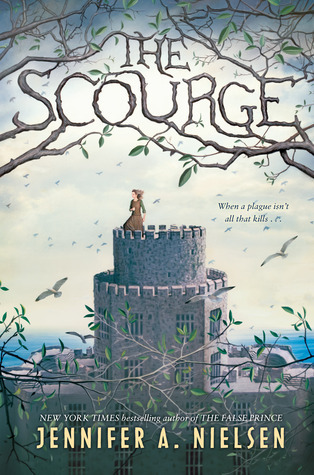 The Scourge by Jennifer A. Nielsen comes out next week, August 30, 2016. If you are looking for a book with a strong female lead character than definitely check it out. This entry was posted in Middle Grade and tagged Jennifer A. Nielsen, Middle grade reader, The Scourge. Bookmark the permalink.